All of the services we offer are designed to provide our customers with flexibility and peace of mind. Need to speak to someone about the possibilities of gluing and quality assurance at high speeds? Would you like more information on reducing waste and maximizing productivity on your finishing line? Want to book a field service visit? Or do you just want to a few minutes of phone support? system. Utilizing Leary systems to their full potential results in the added benefits of higher production speeds, shorter make readies, decreased downtime, less waste and improved quality. Leary offers two service programs which require a minimum of two visits within a twelve-month period. Provides a range of essential services suitable for every Leary system user at a discounted rate. 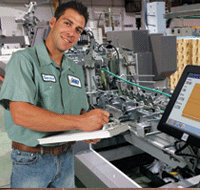 Includes preventative maintenance of gluing and quality assurance functions, system audit and certification. Provides reliable and immediate support for systems operating in the most demanding production environments. Suitable for larger users and those relying on the highest uptime performance. The Leary Training Program is an on-site program provided by a certified Leary Technician for machine operators and supervisors. This program is designed to provide structured, standardized training and empower operators with the knowledge necessary to run at peak performance. This program requires a minimum of two visits within a twelve-month period at a discounted rate. Contact us today and we will show you more ways in which we can support you.